Hi! Spike here! One of the staff here at Acme is having a puppy, which, they are calling “Baby.” The house has been astir for months, in fact, ever since the day they found out that this new addition was on the way. Furniture has been moved around, walls have been painted and all kinds of weird things are starting to appear like indoor swings, a bed that looks like an elevated kennel, and chew toys that AREN’T allowed to touch the floor-what’s up with that? They are even taking classes to learn how to care for “Baby” once she arrives. They are learning what she’ll like, what she’ll need to stay healthy, and what will make her feel safe and secure. They want to make sure that everything is just right for her when she arrives. I think that they must have done the same for me. When I first came to live here, I missed my mom. Laura must have known that because she had a comfortable kennel all ready for me with a warm blanket that was as soft as my mom’s underbelly. It even smelled like her. She also made sure that the food she served me was what I had been eating before I left my mom’s house so that my tummy wouldn’t get upset. She even asked for a couple gallons of water from my first home which they added to the water I drink now until I got used to my new water. When I first came to my new home, Laura immediately gave me a collar with a license number tag and an ID tag that matched my new leash. There was a place for me to run in the back yard, new toys for me to chew, and a doctor who was all ready to take care of me. Laura even took time off work for a few days while I got used to my new home. I remember that she was so patient with me while I learned where to go to the bathroom, what I was allowed to chew, and where I was allowed to be. I’m sure the expectant parents will be just as patient with their new little one because that’s just what you do with babies when you’re responsible and loving parents. I guess when it’s all said and done, all babies need the same type of things whether you’re human or puppy. With patience, love and understanding bonding relationships can be built and enjoyed for years to come. 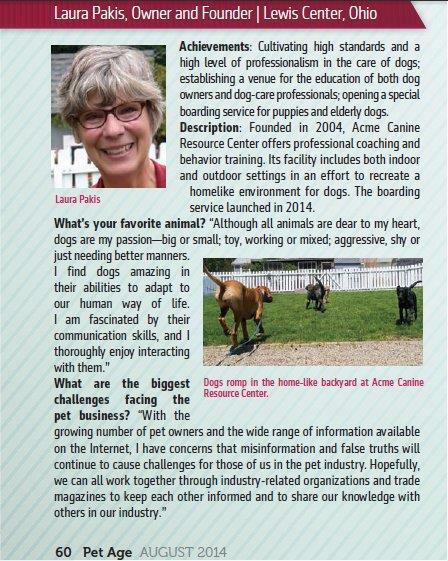 For more information on preparing for and raising puppies, contact Acme Canine. And tell them Spike sent ya! This entry was posted in Puppy training and care and tagged Acme Canine, babies and puppies, caring for a puppy, raising puppies, Spike's Blog, training a puppy. Bookmark the permalink.